What is the heaviest wood in the world? How heavy is it? According to the data given by experts, ironwood is the heaviest among all woods, and each cubic meter of it is as heavy as 1122 kg. Besides, it is also deemed as an excellent wood by all the people. Its texture is hard and tensile, which make it very difficult for people to process and cut the wood. The wood has fine textures and is hard to transform; it is wearable and mothproof, thus it is used in machinery, musical equipment, manufacturing of craftworks and construction of buildings etc. For forestation in parks, ironwood is also a beautiful tree. It has a beautiful cone shape, like the well towers in the villages of the Dai folks in Xishuangbanna; its young leaves change into a reddish color in order to prevent strong ultraviolet radiation, and look like upright girls in red. Its blossom period is from March to May and its flowers are white and fragrant. Its four flower pedals stretch out as if fairy girls are dancing. 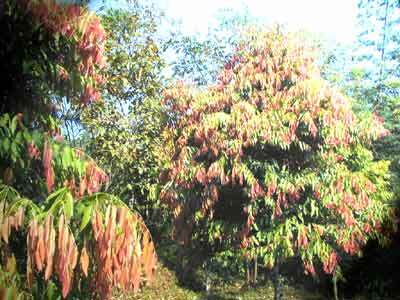 Its seeds are enriched in oil contents, which is as high as 78.99%; and its oil can be used as industrial oil or lighting oil in Buddhism temples.